Flattering Short-Sleeve Crochet Top with Cap Sleeves - Free Pattern! This lightweight crochet top with cap sleeves uses basic crochet stitches to create a beautiful texture and the gathers add a flattering touch for any figure. Get the free pattern in sizes XS-3XL below or purchase the ad-free, printable PDF here! Thanks to Lion Brand Yarns for providing the yarn for this free lightweight crochet top pattern. This post contains affiliate links. Welcome back to the Make & Do Crew guest designer series. 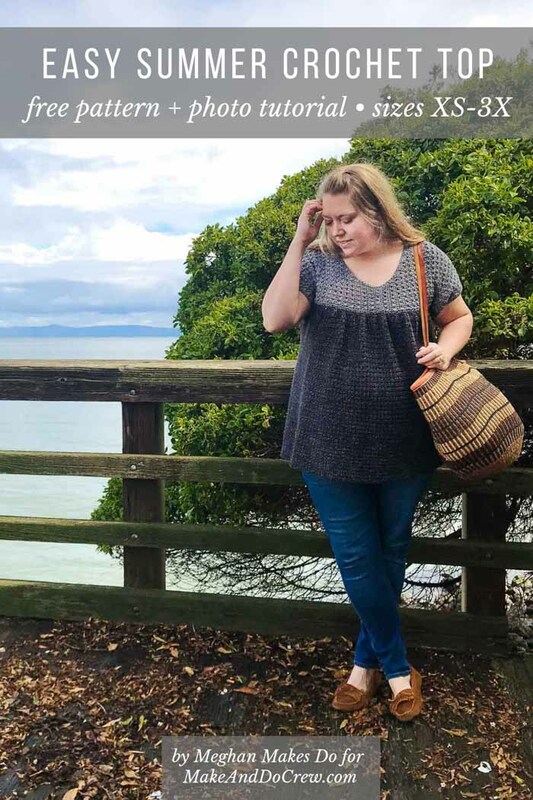 While I’m getting to know the newest baby in our family, Meghan Ballmer from Meghan Makes Do is going to share her flowy, lightweight crochet top pattern with us today! You can see lots of of Meghan’s work on her blog here. And be sure to check her out on social media too: Instagram, Pinterest, and Facebook. Meghan, take it away! Hi everyone, it’s Meghan here from Meghan Makes Do and I am thrilled to be sharing my Andie Top with you today. In case you didn’t know, I’m not only a crocheter, but a sewer too. I love working with all kinds of fabrics and love how easy it is to manipulate the fabric to create amazing drape in clothing. Now that I’m venturing into the world of crochet garment design, I’ve made it my mission to create crochet “fabric” that mimics the look and feel of real fabric as much as possible. 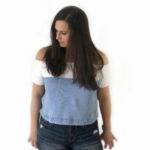 While designing The Andie Top, I wanted to create a garment that would be flowy and flattering on all figures. Using some simple crochet stitches I was able to create the somewhat gathered look in the front which gives it a little bit of an oversized feel. The yoke is constructed first and uses a fun cross double crochet stitch to make it airy and perfect for warm summer days. How To Crochet a Flowy, Lightweight Crochet Top? To make your Andie Top you’ll start with the front and back yokes. You will be working from the center out to create the left side of your yokes first. Then reattaching the yarn to the beginning chains to create the right side. Each size is written separately so scroll down until you find the size you need. The bottom of the top is made by crocheting directly into the bottom of the yokes. You’ll be adding little loops to the front in order to create the gathers so make sure to pay attention to your stitch counts in those first beginning rows. Then you’ll just have to seam up the sides and shoulders to complete your top. 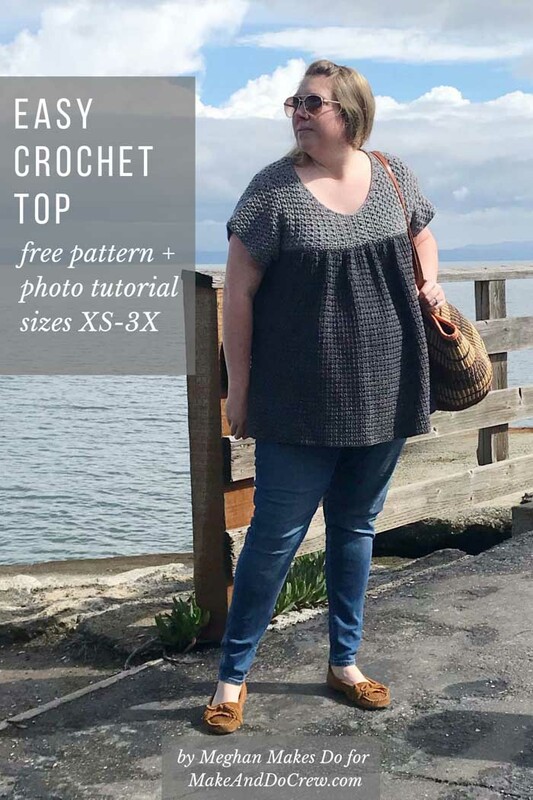 The Andie Top is an intermediate level crochet pattern, but would be great for an experienced beginner looking to learn some new skills in the way of garment construction. 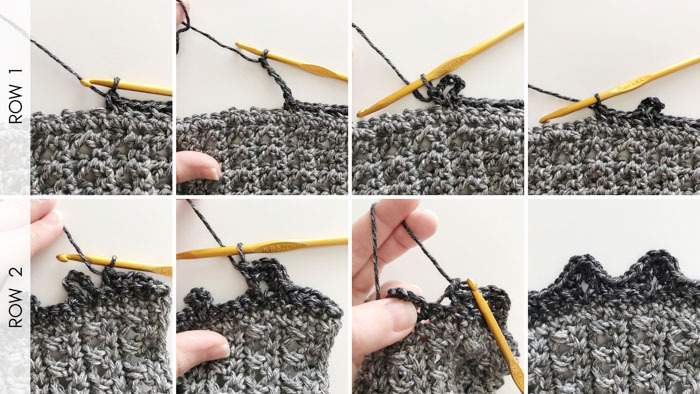 You will need to know the basic crochet stitches like single and double crochet as well as how to increase and decrease. 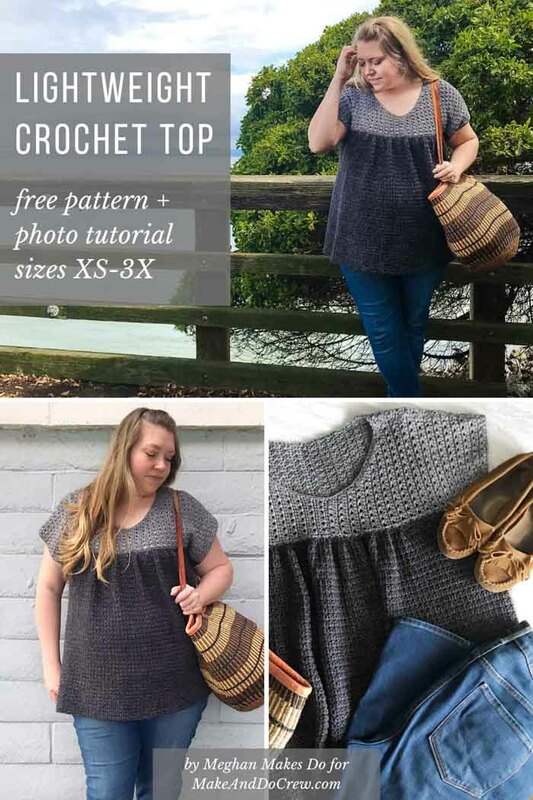 If you love this lightweight crochet top, you might also like to check out these free crochet garment patterns that are perfect for warm weather. You can always find all our free patterns for spring here. The Andie Top is the perfect top for Spring and Summer. Made with 100% Cotton Lion Brand Jeans yarn, it will keep you nice and cool. The unique “gathers” created on the front of the top are perfect for flattering all figures. 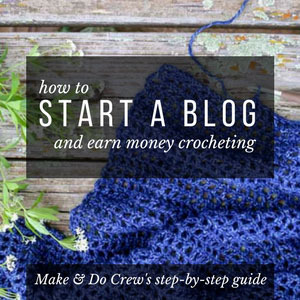 Using a combination of basic crochet stitches you’ll create beautiful textures of fabric. If you have a clear understanding of basic crochet stitches and garment construction then you’ll love the Andie Top! • Chains at the beginning of rows do not count as stitches. • Stitch counts at the end of rows include all double and single crochet stitches. • Yoke is worked from the center out. • Bottom of top is worked from the bottom of the yoke down. • Add or eliminate rows to the bottom of the top to achieve the desired length. instructions for Right side of yoke. Row 25: dc in first st, dc2tog, dc in next st, cdc across until 1 st remains, dc in last st, ch 1, turn. Row 19: dc in first st, dc3tog, dc in next st, cdc across until 1 st remains, dc in last st, ch 1, turn. Row 23: dc in first st, dc2tog, dc in next st, cdc across until 1 st remains, dc in last st, ch 1, turn. Row 33: sc across, ch 2, turn. Row 32: sc across, ch 2, turn. Row 21: dc in first st, dc2tog, dc in next st, cdc across until 1 st remains, dc in last st, ch 1, turn. each sc row and 2 sc in each cdc row. On the last sc switch to Color B. With Color B yarn attached at the bottom of the back yoke ch 1.
each sc row and 2 sc in each cdc row. On the last sc switch to Color B. See photo tutorial above. With black yarn attached at the bottom of the front yoke ch 1. Finishing: Lay front and back pieces together with right sides facing. Sew shoulders together. flip top right side out. joining and evenly around neck line, sl st to first st, fasten off and weave in ends. *For a narrower neckline sc around a second time decreasing every few stitches. 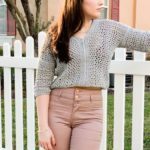 Thanks again to Meghan of MeghanMakesDo.com for sharing this free cropped crochet sweater pattern! 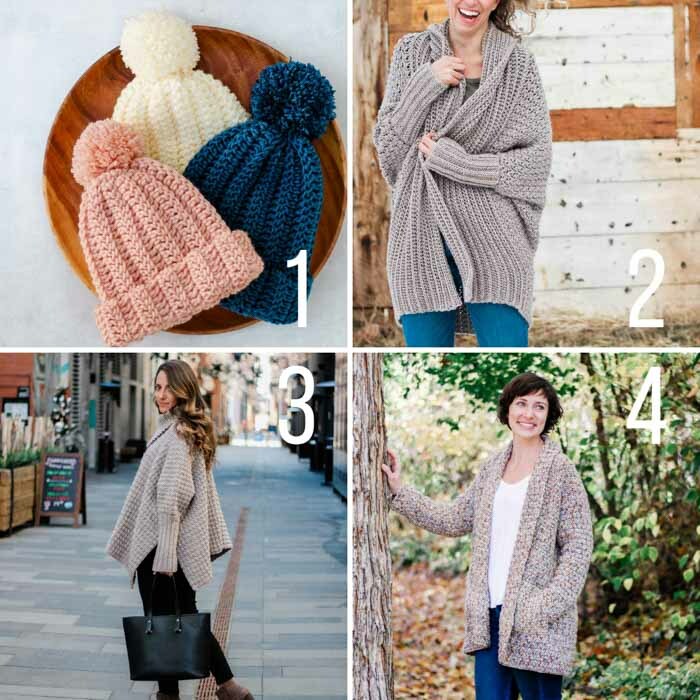 Be sure to check out Meghan’s blog for lots more free modern crochet patterns! Ready to get on a crochet roll? We have lots more free patterns, many of which include video tutorials. Here are a few reader faves! 2. 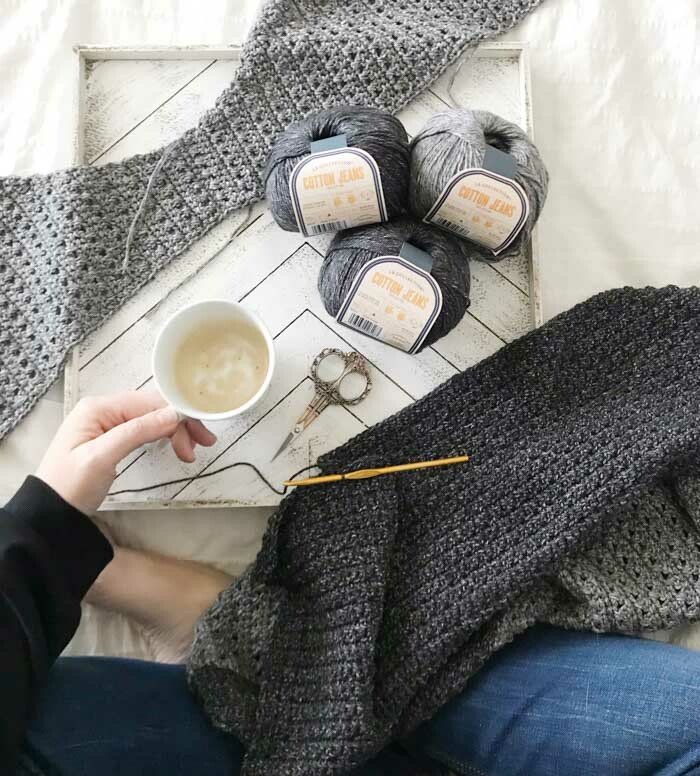 Habitat Cardigan + video tutorial – No one will guess you created this figure-flattering cardigan from a simple rectangle. Even if you’ve never crocheted a garment before, you can make this simple cardigan. 3. 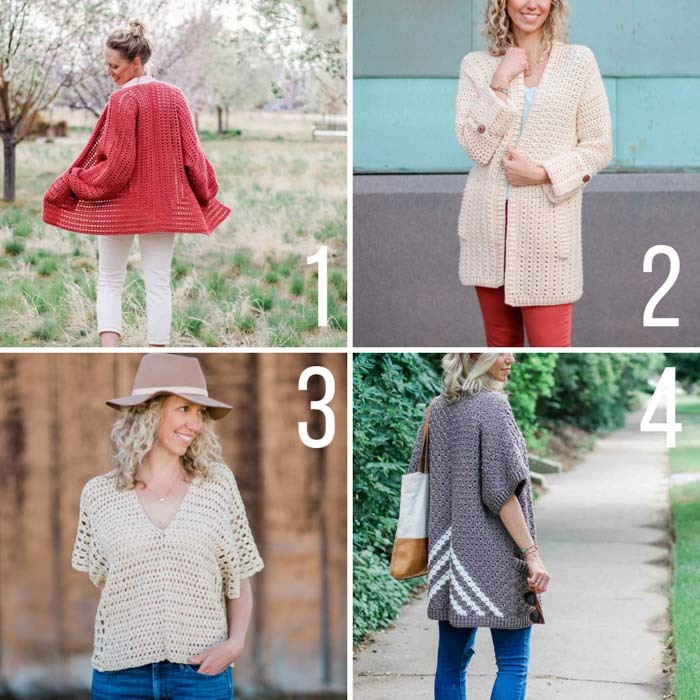 Alpine Poncho + video tutorial – This stylish crochet poncho with sleeves is very easy because it’s made from five simple rectangles. 4. 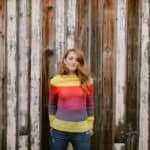 Up North Cardigan + video tutorial – This easy, cotton crochet cardigan pattern for beginners uses a very simple construction to create a show-stopping look with entry level skills. 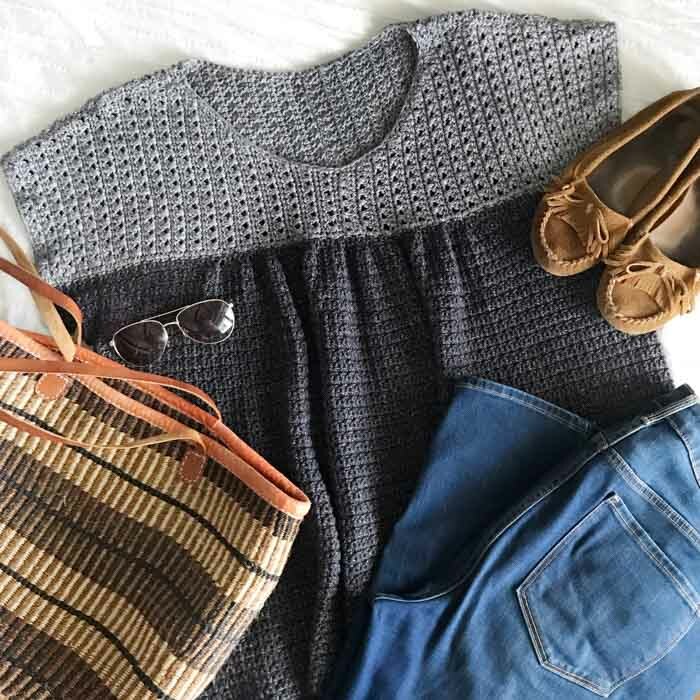 You’ll find yourself reaching for this cardigan all year long. Your handmade is so beautiful, kindly I would like to learn from you. Thanks so much! I’m happy to have you here! 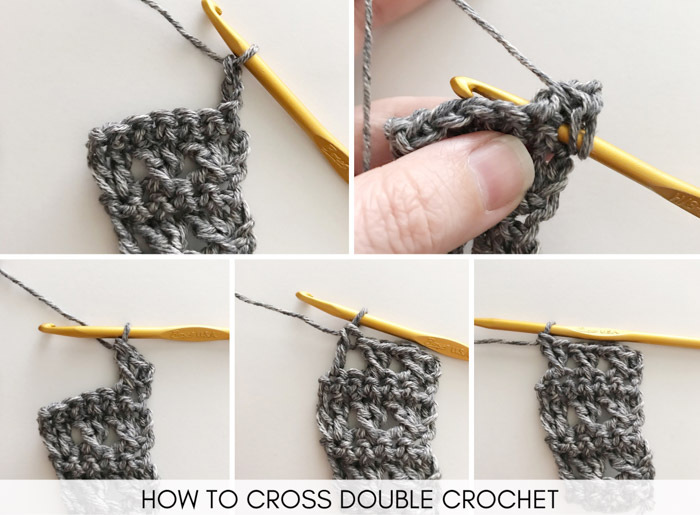 Do you have written instruction for the cross double crochet? The picture tutorial is not very helpful. Thanks. Yes, I see what you mean. Let me see if the designer can clarify a bit. I’ll try to add an additional note to the pattern to clarify once I hear from her. Hello! For the cross double crochet you will skip a stitch, then dc in the next stitch. Go back to the skipped stitch and work a dc around the dc you just made and into the skipped stitch. Hope that helps! This is really beautiful, I intend to make one for each of my daughters! Maybe even one for myself! Looks like it will be a comfy fit for my pregnant belly! Could you use a cotton/poly blend that’s also a 3? I don’t see why not. I’d just check your gauge with a small swatch to see if you need to adjust your hook size at all. And I have no idea why my reply posted under an entirely different comment thread. I love this pattern! I started mine two days ago. We love hearing that! I hope you enjoy the pattern. I posted my colors on Ravelry. I am doing the body soft lilac and the yoke baby pastels. I am loving the colors together. I do love this pattern! When trying to download it for free, some of the instructions are whited out. Any help for this?